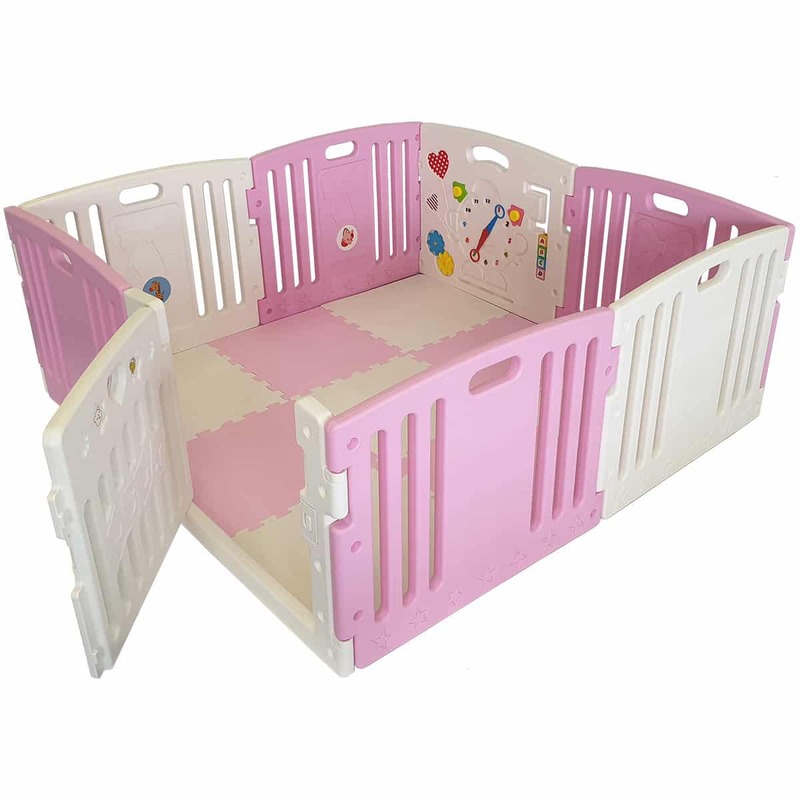 A stylish re-colour of our supremely popular ‘All Stars Baby Playpen‘. 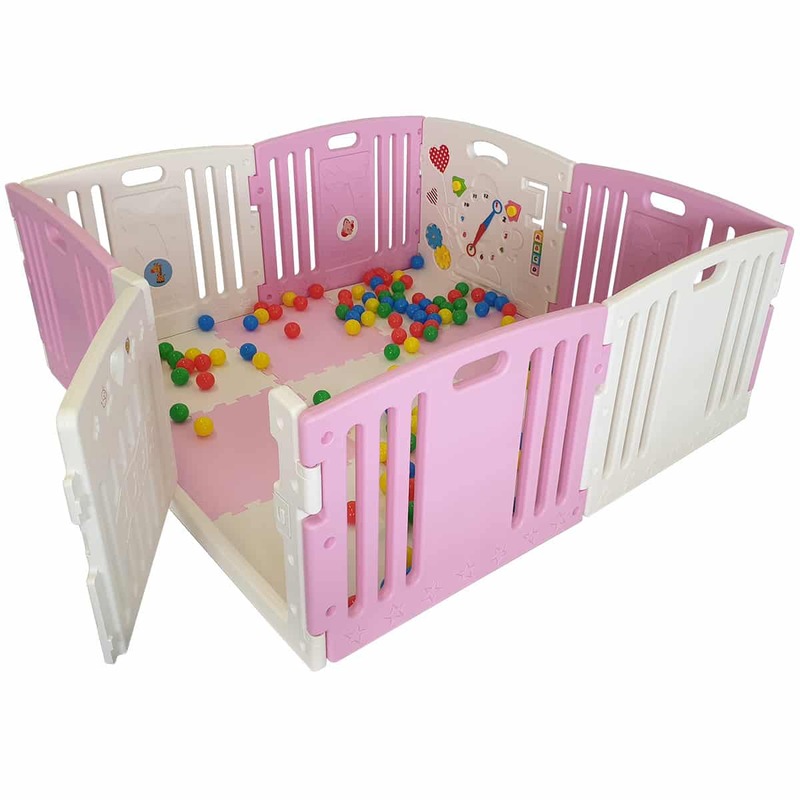 Popping in pink this baby & toddler playpen is perfect for play! 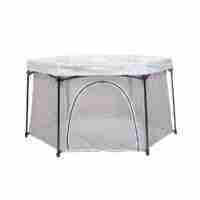 Suitable for both indoor & outdoor use. 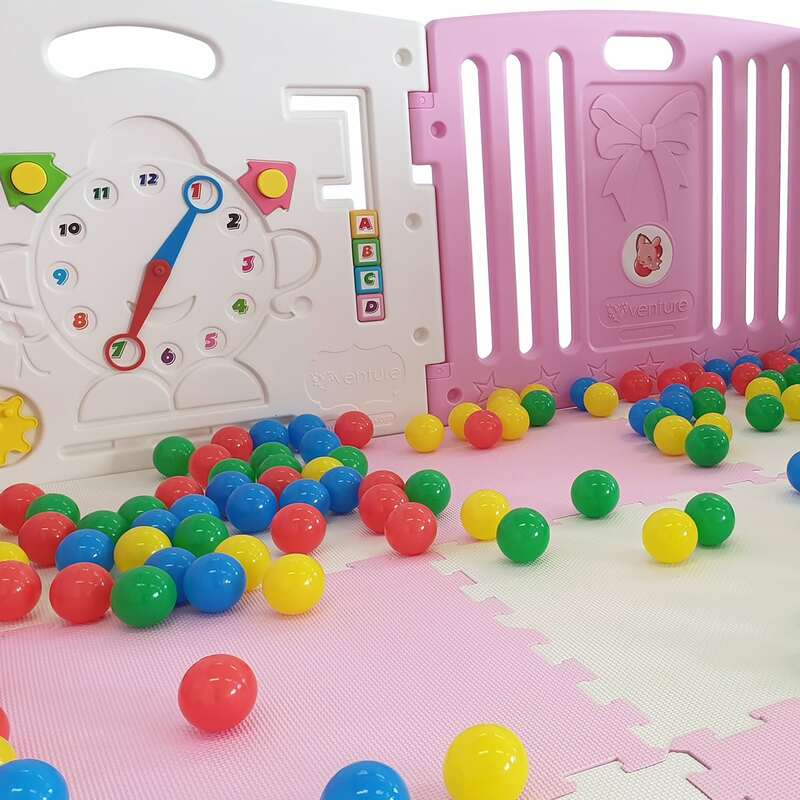 Includes soft playmats and coloured play balls. 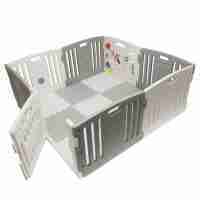 Easy assembly with push-fit panels. These numbers are a guideline only. Please refer to the instructions provided with the item before use. 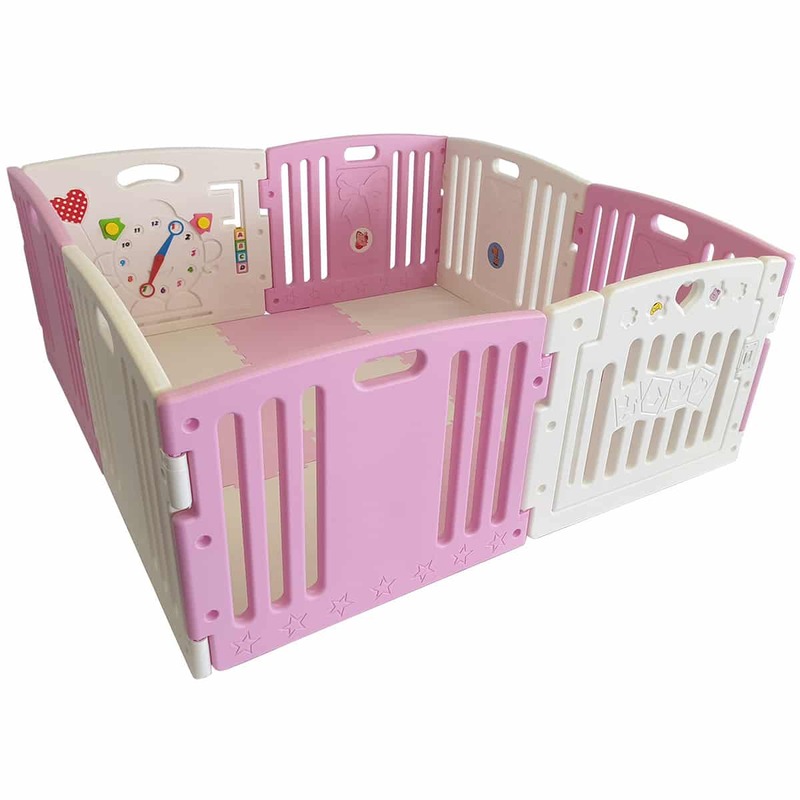 Now in popping pink our All Stars DUO playpen is a great space for your little one to play and relax safely! 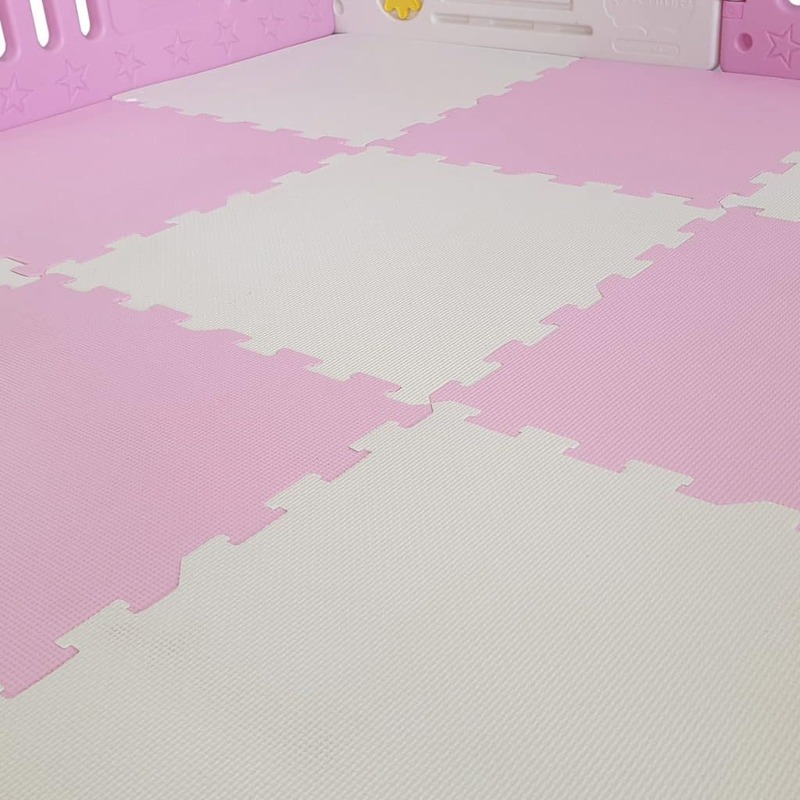 The two tone design gives the playpen a more attractive look, meaning you can happily place it in your lounge or nursery without the concern of it overwhelming the room with garish colours. 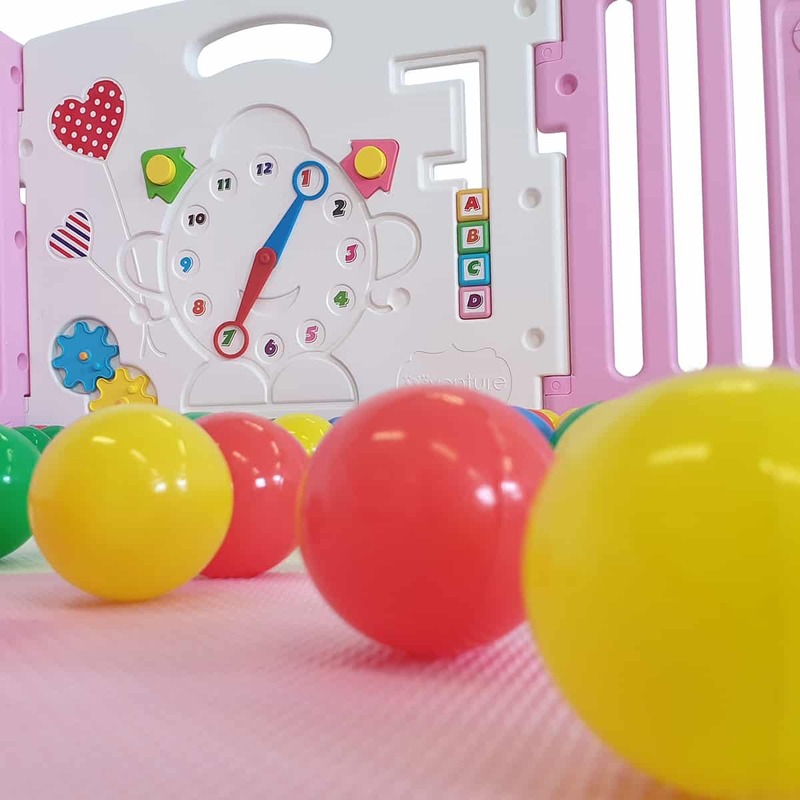 The soft EVA playmats perfectly compliment the pink and white panels to make the pen a fun and engaging place for your little one to play, and if you feel you need to add a little extra colour, simply pop in the included play balls and watch you little one smile in joy! 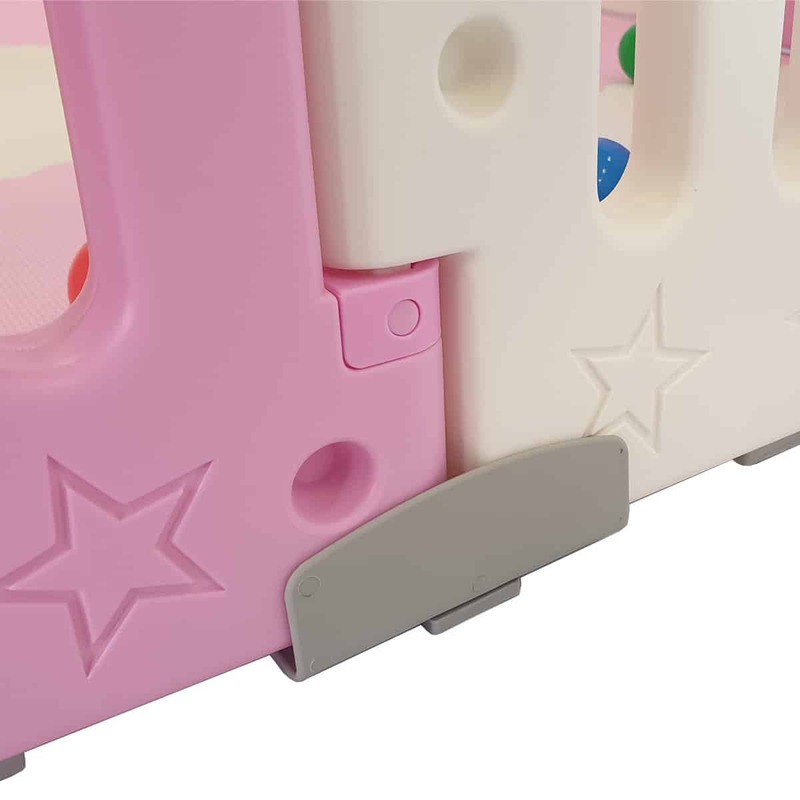 Each of our All Stars DUO baby playpens comes with a feature packed activity panel designed to aid children in learning colours, numbers and letters. 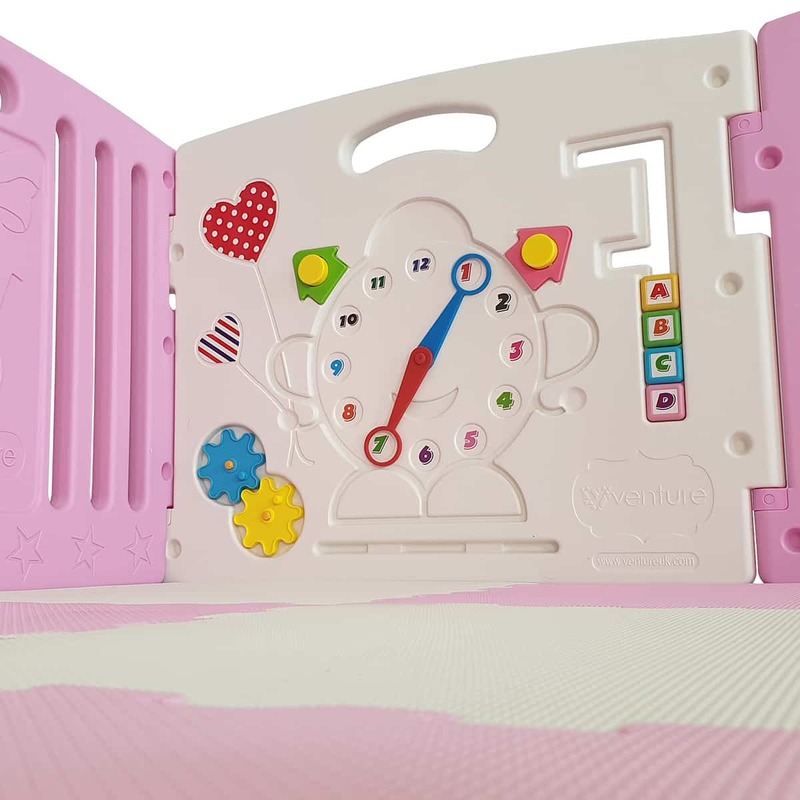 The hands on the clock face can be moved around freely, so baby can discover numbers independently or with the help of a parent guiding them through. The panel also includes a letters game great for starting off the ABC’s and a two turning cogs that are great for encouraging use of motor skills. 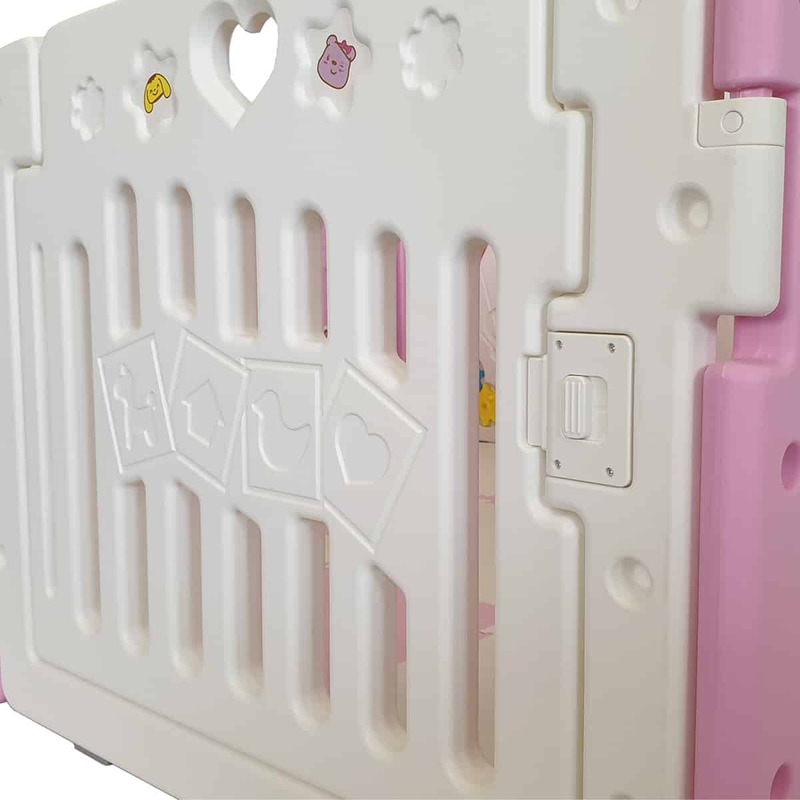 The All Stars DUO pink baby playpen also features a lockable safety gate designed to be easy for an adult to open but impossible for a child that’s inside the pen. Working on a simple sliding latch mechanism the gate can be open and closed quickly and easily by simply sliding the latch from left to right. The sturdy nature of the plastic lock means it stays in place even when the gate is being pulled on or pushed.